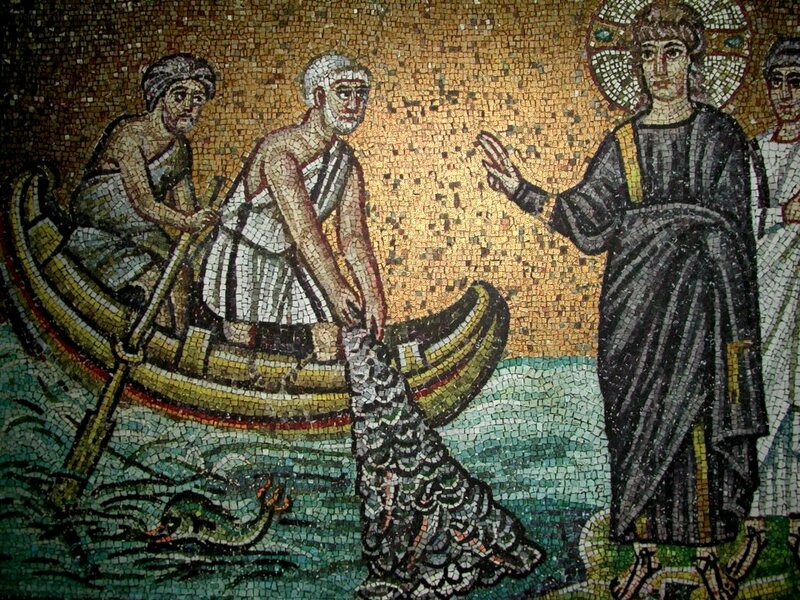 Jesus called fishermen as his first disciples and instructed them to become “fishers of men” (Matthew 4:19). Does this mean that people will be forced to be followers of Jesus, caught in nets that they cannot escape? It depends on where you put the emphasis – on the fish or the fishers. Jesus clearly used the metaphor of fishing because he was speaking to fishermen. The metaphor has nothing to do with trapping/deceiving/manipulating people into believing. Those are the methods of cults and other religions, including fundamentalist versions of Christianity. Fishermen worked hard, very hard – they still do. Jesus is telling them that they will have to work even harder to bring people into the kingdom of God. Human life is messy. The world is a complex place. Don’t believe anyone who tells you Christianity is simple. It’s not simple, because life isn’t simple! The demands of Jesus are not straightforward. His use of metaphors like fish and sheep to describe the people who follow him does not mean that he wants us to be mindless, unquestioning followers. Jesus only desires people who will follow him freely, without coercion or deception. Jesus does not look for blind faith. He himself welcomed dialogue and debate. He faced the questions of people who didn’t understand or didn’t want to understand him; and he questioned them right back. The four gospels can be read as a series of dialogues and explorations with Jesus. Today, too, Jesus looks for people who will enter into dialogue with him. That’s where true faith is found, in that dialogue! To more fully understand the kind of faith that Jesus looks for, let’s read the earlier part of chapter 4 in Matthew. This is the scene of the “three temptations” that Jesus faced after his baptism in the Jordan. Here is how Matthew describes the scene. Notice how this too, is a scene of dialogue, debate and exploration of the meanings of scripture. Jesus confronted the devil in the same way as he confronted all challengers: through dialogue and argument, not force or manipulation. This is the way of Christian freedom. There is no better explanation of the three temptations than Dostoyevski’s parable of the Grand Inquisitor, which occupies an entire chapter in his great novel, The Brothers Karamazov. Dostoyevski was a devout Orthodox Christian, but was very honest in his views of the church and Christianity. And honesty is essential when you think about the church. I love the hymn that we sing every year at Holy Friday evening at the Lamentations: Τέξασα ζωήν, Παναμώμητε ἁγνὴ Παρθένε, παῦσον Ἐκκλησίας τὰ σκάνδαλα, καὶ βράβευσον εἰρήνην ὡς ἀγαθή. We sing to the Theotokos, the Mother of Christ, to “stop the scandals of the Church”! Right there, in the middle of one of the most popular services of the year, we acknowledge that not everything is right with the church. It’s one of the most honest hymns we sing all year!! The Grand Inquisitor represents the greatest scandal: when the church of men of the church presume to know better than Jesus what human beings need. The Grand Inquisitor is a parable told by one of the characters in the Brothers Karamazov. The parable takes place in the 16th century, during the time of the Roman Inquisition. Jesus appears in Seville, Spain, and the crowds recognize him and throng to him. The Cardinal, the Grand Inquisitor himself, appears and immediately arrests Jesus. He then confronts Jesus in prison and accuses him of getting it all wrong about human beings. Accusation after accusation is thrown at Jesus by the old man, and Jesus listens without speaking a word. The Cardinal uses the three temptations to prove his central message – that Jesus was wrong to trust in the freedom of human beings. Here are a few select quotes from the Ignat Avsey translation published by Oxford University Press in 1994. Notice the sheer arrogance from the very first words that come from the Grand Inquisitor’s mouth. “Is it You? You?” There being no answer, he adds quickly, “Don’t answer, remain silent. After all, what could You say? I know only too well what You would say. And You have no right to add anything to what You have already said. So why have You come to disturb us? For You really have come to disturb us, and You know it. Freedom of faith was dearer than everything else to You then, fifteen hundred years ago. And didn’t You Yourself say so often, ‘I want to make you free’? Well, now You’ve seen them, these ‘free’ men. That first temptation in the desert… You rejected in the name of freedom, which You elevated above everything else. You knew that Your glorious deed would be recorded in the Scriptures, would reach to the depths of time and to the furthest limits of the earth, and You hoped that, in following You, man too would remain with God without need of miracles. But You didn’t know that as soon as man rejected miracles he would also reject God, for man seeks not so much God as miracles. You did not come down from the cross when they shouted at You, mocking You and ridiculing You, ‘Come down from the cross, and we shall believe that it is you.’ You did not come down because once again You did not want to enslave man by a miracle, and You thirsted for a faith that was free and not inspired by miracles. Why did You refuse that last gift? Had You accepted that third suggestion of the mighty spirit, You could have provided all that man seeks on earth— that is to say, someone to worship, someone to take charge of his conscience. You would have founded a universal kingdom and brought universal peace. For to whom is it given to rule over men, if not to those who rule over their conscience and in whose hands is their bread? It is a devastating chapter, and it can be read by itself without the rest of the Karamazov novel – although you would then miss out on one of the greatest literary masterpieces of all time. The Grand Inquisitor represents a vision totally contrary to that of Jesus. It’s a vision that has no room for human freedom – the freedom for which Jesus died, the freedom that is yours today. Be alive in Jesus! Categories: Sermons | Tags: Brothers Karamazov, call of disciples, Christian freedom, Dostoyevsky, Grand Inquisitor, three temptations of Jesus | Permalink. Thanks for successive weeks of directing me to a masterpiece of art (Beethoven/ Dostoevsky) It’s always good to be shaken out of the feebleness of one’s own understanding by something more adequate to life. Thanks also for your words about “fishing” – I totally agree that no pressure, deception, lies or snake oil sales techniques should be used in evangelism. But I live in a country where secularisation is almost complete, working for a church that cannot find new ministers, and I retain enough of my upbringing in evangelical circles to insist that the church not only has to practice God’s love but also has to tell its story. In public, as Jesus did. I don’t have too many clues as to how this may best be done, but people can neither accept nor reject in freedom unless the gospel is somehow made available. I’m sure you will have better thoughts on this than me!